Besides taking over Grandma Sharon's shop, you have to spend some time doing Grandpa Graham's farm chores. He hurt is back and now needs someone to water crops and take care of the animals. When you first start your life on the farm, Grandpa gives you some Tomato seeds and shows you how to plant them. The next day, Grandpa will unlock a second crop field for you to use. You can buy more crop seeds at the Seed Shop in town. The seeds at the shop have different water requirements depending on the quality of the seeds. "Good" seeds need to be watered every day, "Great" seeds need to be watered every 2 days, and the "Super" seeds only need water every 3 days. To get the higher quality seeds to unlock in the seed shop, you need to buy the lower version and allow the crop to mature. You can then go back to the shop and buy the next rank. You will need to come back to your game and water your crops when they need it. If you miss a day, then the next time you start My Little Shop you will find wilted crops. You will have to select the field, choose "Clear Field", and then replant your crops with new seeds. If it is raining in the game, you don't have to water your crops. You will only have two crop fields to grow plants on. Takakura's Carpenter shop has more fields to buy, which will increase your total fields to five. The first extra field is 700 G, the second is 1200 G, and the last field is 2000 G.
The mature crops can't be picked, but instead are used as ingredients at the Juice Bar. You won't start the game with any animals on the farm. 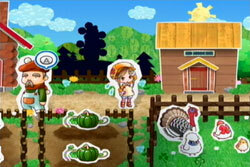 Animals can be bought from Mint and Nick at the Animal Shop, and are automatically sent to your farm. You can only own one of each animal. If you don't take care of an animal for 3 days, it will run away and you will have to buy it again. "She's so happy! Show her you love her." "She seems a little hungry." "She's so hungry! I hope she gets fed soon!" If you still don't feed or pet your animal, it will run away. You will be greeted by Mint and Grandpa when you leave your house if this happens. To get the animal back, just go to the Animal Shop and buy it again. There are four types of birds you can own: a chicken (500 G), quail (1000 G), silkie (3000 G), and turkey (2000 G). The turkey requires you to buy the Egg Stand Set add-on package before it appears in the Animal Shop inventory. Taking care of poultry is very simple. The only thing you need to do is feed them every day. Select the bird you want to feed and then press A. You will have to feed each one individually. The birds will lay eggs that you use for the Egg Decoration Stand. 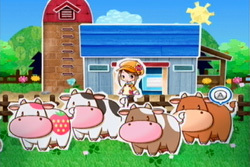 The cows will graze on the grass in your pasture, so you don't have to feed them at all. Cows do require some brushing to make them happy. You will need to buy a brush for 500 G at the Tool Shop. Use the brush on the cows every day and they won't run away. After you buy the standard brush, you can buy a Silver Brush for 2200 G and finally a Gold Brush for 3000 G. The high rank your brush is, the happier your cow will be. There are four different types of cows: dairy cow (1200 G), jersey cow (2000 G), coffee cow (3200 G), and strawberry cow (2000 G). The strawberry cow requires the downloadable Ice Cream add-on package. If the weather is raining, then your cows will be inside of their barn. You will have to feed them on rainy days by pressing A at their feed troughs.